We begin in the streets of Vienna in 1823 where rumors are flying that old man Salieri (once the famed director of the Italian opera and a favorite of Emperor Joseph II) has confessed to murdering Wolfgang Amadeus Mozart. Salieri appears in his room and tells us, the audience, that he indeed poisoned Mozart, vowing to tell us the whole story. With that, we race backward in time to 1781, right before Mozart and Salieri meet. A young Salieri is a devout Catholic who has vowed to dedicate his life to composing music in the name of God. 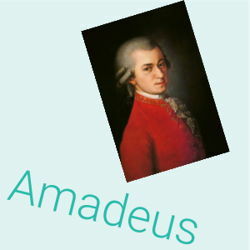 He is a favorite of the Royal Court and feels stable in his job and reputation until he hears the name Wolfgang Amadeus Mozart. Mozart is on everyone’s minds and lips around Vienna, and Salieri becomes anxious to meet this young composer who has been known as a musical genius since childhood. Salieri finally meets this acclaimed Mozart and, to his horror, Mozart turns out to be a perverted, immature, vulgar young man. However, his music is indeed the thing of myths…its genius pierces through to the very soul of Salieri, who can’t understand how this petulant young man received the musical gift that he has been working towards his whole life. Right then and there, Salieri swears off God and religion and decides to dedicate himself, instead, to ruining Mozart’s career. Along the way, he not only ruins Mozart’s career, but also his life, all while hiding behind a mask of friendliness and concern for the young artist. We watch Salieri poison Mozart’s reputation which eventually leads to his destruction and death. A highly fictionalized account of the relationship between these two real life composers, Peter Shaffer’s Amadeus takes us on a wild ride through the trials and tribulations of genius, jealousy and revenge.